Erie Train No. 3 pausing in Marion on its run from New York to Chicago. Indeed, something terrible had occurred. As the search party proceeded east, “Brains, pieces of skull, entrails [and] the arms and legs were scattered along the track, the body being literally torn to pieces.” Other belongings – a watch, a pass book, a revolver – were all identified as Mr. Hunter’s. Since the revolver had one empty chamber, the obvious conclusion was that Hunter had killed himself. Whether it was the bullet or the train that actually did him in, however, was (and remains) a mystery. I suppose that, like a lot of people in Marion, I have mixed feelings about the trains that rumble through town day and night. There have been times when I’ve thought I’d lose my mind as a train has rolled slowly by at five miles per hour (or not at all) and made me late for work. Still, who hasn’t been lying in bed late at night and listened to the lonesome (though somehow comforting) sound of a train whistle blowing in the distance? Although passenger trains no longer pass through Marion, freight trains—around seventy-five per day according to local train buff David Luyster—continue to pass through town. Quite simply, living in Marion means living with trains. Although there were two roads passing though Marion in the 1840s, they were not without their disadvantages. For one, the roads were privately financed and thus charged a toll. They were also often impassable in bad weather. Farmers who needed to transport their crops to market needed a better solution, and when the first rail line came to Marion in 1852, the farmers quickly realized the two big advantages trains offered: they were relatively cheap, and they were reliable. 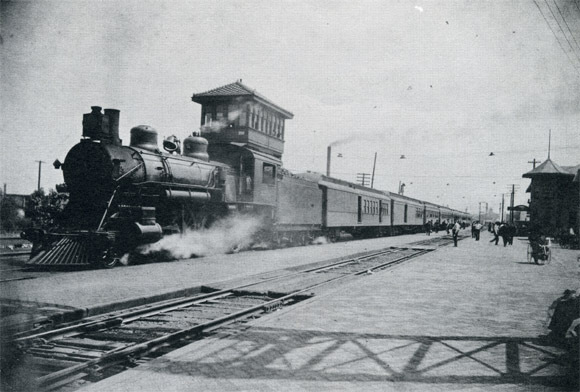 As Marion became more industrialized, the importance of the railroads only increased. Clearly, then, trains have always been a fundamental part of Marion’s history and identity, and so it should come as no surprise that they turn up in some of the more gruesome and spooky stories as well. To read more train stories, including the one about the haunted railroad crossing near LaRue, pick up a copy of Haunted Marion, Ohio.